Number 18, or collegeknitting. Congratulations and I’ll be in touch asap to get you your copy! 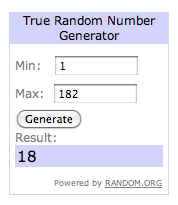 Thank you to everyone who participated in the giveway, it is always so exciting to give things away and you just never know which day will be your winning one. Knitting continues normal pace around these parts, and along with various stages of design work behind the scenes, I’m getting in gradual but steady progress on a few of my summer projects. …and the green lacy thing I cast on with Willow St. silk from Shall We Knit is on its way to being a slightly larger lacy thing. 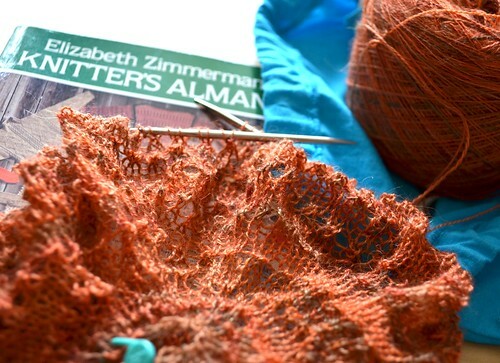 A warm week awaits, and despite all the projects on my needles already, I can’t help but think ahead to new ones. There’s lots of June left to go and lots of knitting can fill that time! Happy Monday, where ever you are. Nice to see progress being made on your projects. I think I knitted 2 rows last night just so I could feel like I am making progress even if it is slowly. It is full winter here in the southern hemisphere and I am still knitting winter projects In the hope I will get some wear this season. Keep the projects coming. I am always inspired by your great colour selection. I love that you do multiple projects at once. I try not to let myself do that or nothing ever gets finished. I am only allowed on project at a time. I agree that steady and slow wins it. I am working on a project I started a long time ago. Just finished one and attempt another one. One project at a time get me bored. i, of course, LOVE anything lacey!! esp that ORANGE!! it’s become my new fav color!! i’m starting a Prayer Shawl Ministry at my church so i will ALWAYS have something OTN!!! How in the world do you knit at the movies! I would never be able to do that. I’m glad to see that I’m not the only one who casts on a project just for the movies! I can’t sit still during a movie, or I’ll fall asleep. If I knit, my hands stay busy! You have several pretty projects going. Can’t wait to see them finished! Knitting at the movies is not so bad. If its straight knit or purl is ok. I have always knit in the movies and even when driving. Not a safe thing to do, but when I am waiting for the stop light to change I put i a few stitches. Can I get the pattern for the orange project. Oooh! Interesting pooling on the socks. Can’t wait to see the end result! Looking forward to seeing more of the green lacy thing – very lovely! I love that bag you’ve got your green lace in! Where did you get it? Tell me about the Pi shawl. I love knitting in the movies, too. Simple stitches, of course;ribbing, cables. Keeps me from eating too much. So much work can be done during a movie. I’m working on 3 projects now and I’ll have to start my Christmas gift knitting soon so I don’t lose my mind later. Love your project colors. I love the sock yarn. May I ask what it is, and where you got it please? 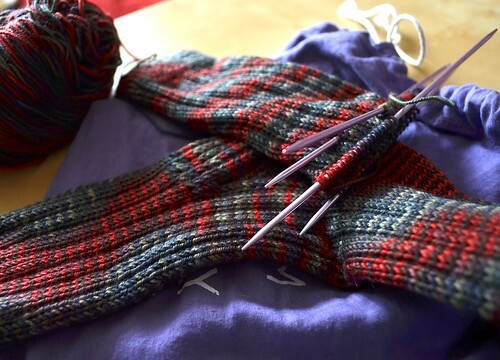 What sized needles are you using on the socks? Are they 2.75 mm? Thanks so much! And good luck on the WIP’s. I was just thinking that I’m feeling like some lace, and then I remembered that the sweater that I’m working on is BOTH cables and lace. Perfect! 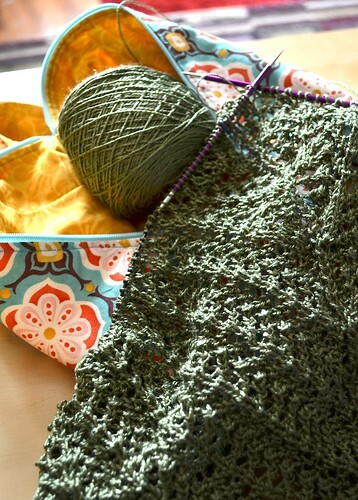 Is that green lacy thing going to be a shawl as well? Came across your blog when I googled knitting blogs. And yours was the second in the results! Great blog and pretty awesome accomplishment! Great progress! As i’ve spent a few weeks with my spinning I needed to get some knitting and crocheting that had been put aside the last two weeks. You take absolutely gorgeous pictures! The light, the colors are captured so nicely, the staging makes little vignettes … beautiful. P.S. I love the project bag that is peeking out from under your green lacy thing. Can you share details on where you got it? Glenna, I don’t think so!! I just saw the movie last night. Even if you’re able to knit by touch, you’ll either be stabbing it and making big holes or the whole works, needles and all, will fly out of your hands and land three rows in front of you! !